One of the joys of staying in New Jersey as opposed to staying in the middle of Manhattan, is the excitement of waiting on the hotel courtesy shuttle bus to take us to the Secaucus Train Station. We have made it a habit to get downstairs about 15 minutes before the “scheduled” pickup time. 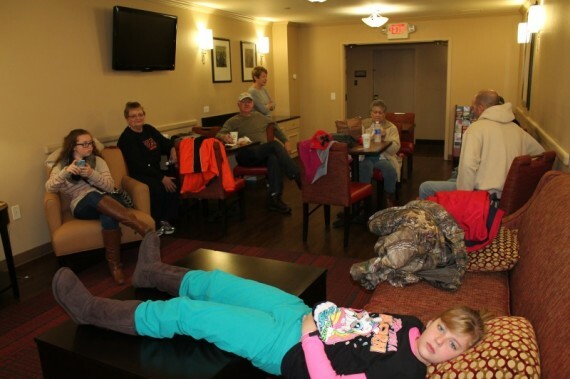 Fortunately, our hotel has a pretty nice lounge for us to do our waiting in. Waiting on the hotel shuttle. 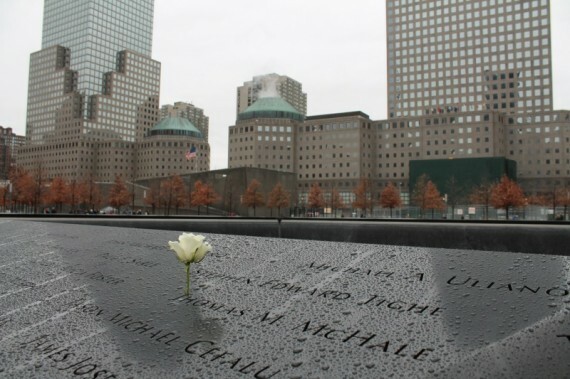 Our first scheduled event for the day was an 11am reservation for the 9/11 Memorial. After a full day of using mass transit, we feel like we are getting the hang of it. But we did have that mishap at Penn Station this morning when we got to the subway platform and realized that Mallory wasn’t with us. Stephanie and I hustled back to the gate and she was stuck on the other side. 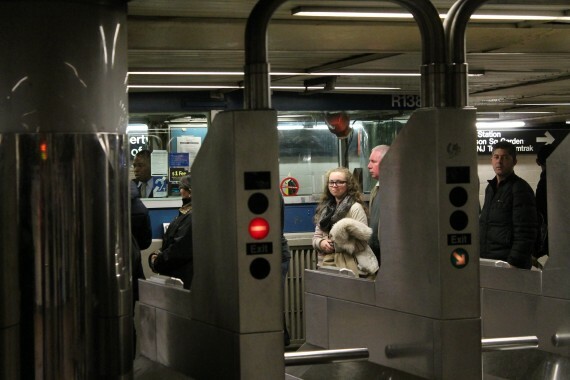 Her metro card didn’t let her through the first swipe, and on the second swipe, it said it had already been used. We had purchased a 7 day unlimited card, but the metro card has a neat feature that once it has been scanned, it is inactive for 18 minutes. To Mallory’s credit, she kept a cool head. She is not the panicking type. After getting Mallory to stand in line for a 1 trip ticket for a few minutes, Stephanie just opened a side door and let her through! We did eventually get to our subway stop for the memorial, but it seemed as though we still had to walk forever to get there. We did eventually arrive right on time, and were thankful we had our pre-printed reservations as we took the express lane to the front of the line. I guess you can just show up and stand in long lines and eventually get into the memorial, but why would you want to do that? The warnings we had heard about security were only partly justified. It was essentially the same as going through security at the airport. Nothing more, nothing less. There was a light rain / drizzle all morning and overcast skies. If you had to order up the type of weather that would best represent the mood of the memorial, I think this would be it. I was looking forward to the memorial, but I honestly had no idea at all what it looked like. Stephanie had seen some pictures previously and knew what to expect. The design is called Reflecting Absence. The memorial contains two 1 acre pools with waterfalls. These are the largest manmade waterfalls in the United States. 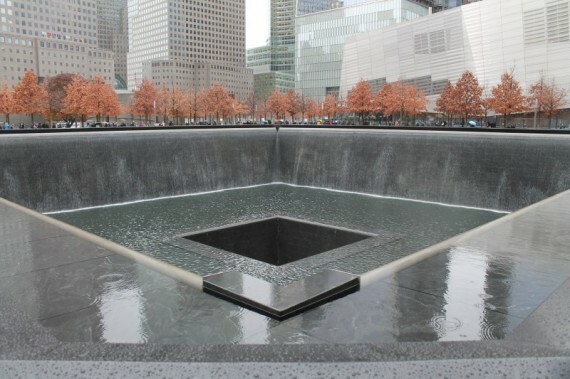 It is supposed symbolize the loss of life and the physical void left by the terrorist attacks. A flower is placed on each victim’s name on their birthday. We saw quite a few flowers today. 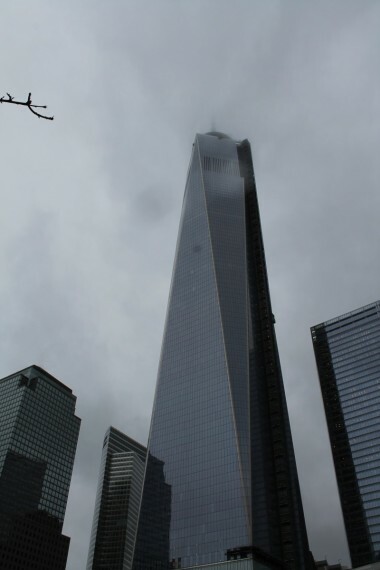 Freedom Tower, as seen from the memorial. The sky was so overcast, the top of the spire was not visible. Scott, Erin, and Erin’s Grandma. I had my own interpretation of the memorial, for what it’s worth. The top level of the memorial is still, calm water, then it abruptly drops off into the waterfall. This is our day to day life. Everything is calm, but then something tragic can occur and your life is changed in an instant. When the water hits the lower pool, it is very turbulent and then as the water makes its way to the lower fall, the water gets more and more calm. Immediately after a tragic event in our lives, everything appears chaotic. But time heals all wounds. As time passes, the results of the tragedy are not as pronounced as they were initially. The memorial itself was very loud. As you can imagine with those very large waterfalls. There were multiple NYPD officers patrolling the grounds as well as volunteers to answer questions. I think everyone in our group appreciated the memorial. After some time in the gift shop, our group split apart with just Stephanie and the girls and I together. 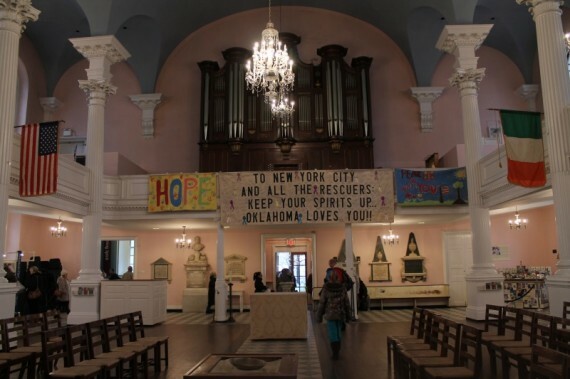 We visited St. Paul’s Chapel which is basically adjacent to the World Trade Center location and was used as a base for much of the rescue and support after the bombing. When we stepped inside, there was a service in progress. 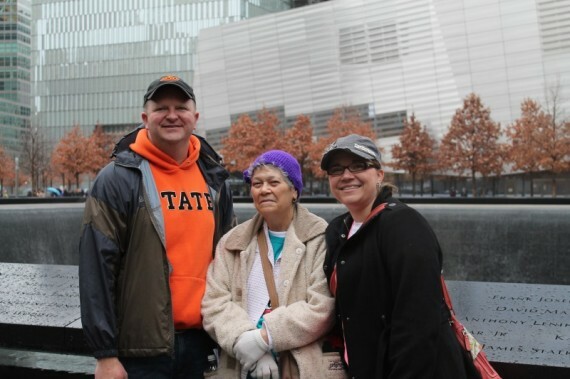 We joined the visitors walking around the perimeter of the interior looking at their various 9/11 exhibits. At this point, we found a little taste of Oklahoma. The interior of St. Paul’s Chapel. This banner had been signed by hundreds of firemen from the Oklahoma City area as a sign of support. Those firemen had been through their own version of 9/11 during the Murrah Building bombing in 1995. It was a nice gesture and it was neat to see that the church still had it displayed prominently. 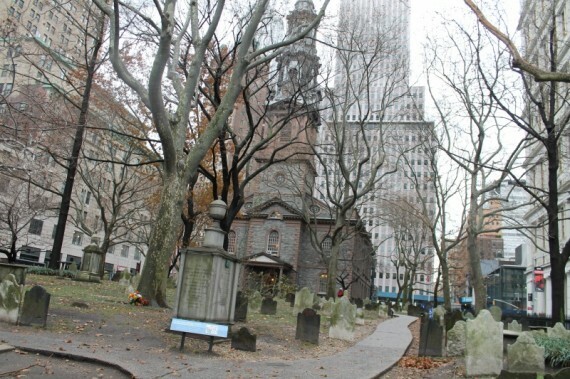 Another neat historical note of St. Paul’s Chapel was that President George Washington had visited the chapel the day of his inauguration in New York City to pray. There is a replica pew in that place now called the President’s Pew. One of the food related tasks on our todo list was to visit a deli. We crossed that off at lunch today. 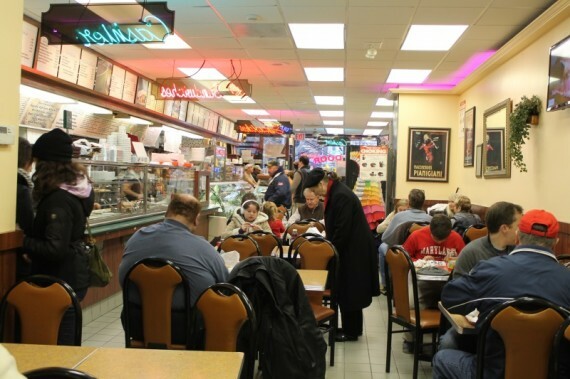 We visited the Stage Door Deli, which is just across the street from St. Paul’s. It offered great tasting, reasonably priced food. The Reuben was a monster of a sandwich. I also got to try Utz potato chips for the first time. Once lunch was over, it was time to do a few things for the girls. Mallory wanted to do some (big surprise) shopping. Our tour guide yesterday suggested a department store called Century 21. We had never heard of it, but were willing to try. That place was crazy! This store was just a few blocks from St. Paul’s. It was 5 floors of clothes and it had mobs of people everywhere. The place was packed to the gills. The store offered these small plastic cards on two wheels that you pulled around behind you to haul the clothes you were wanting to buy. I had never seen anything like that either. Even though we spent an eternity there, we didn’t buy anything. I am not complaining. Next up was a short subway ride to Little Italy and a trip to Economy Candy. Marissa had seen this store, or one like it, on a television show and had been talking about it for months. 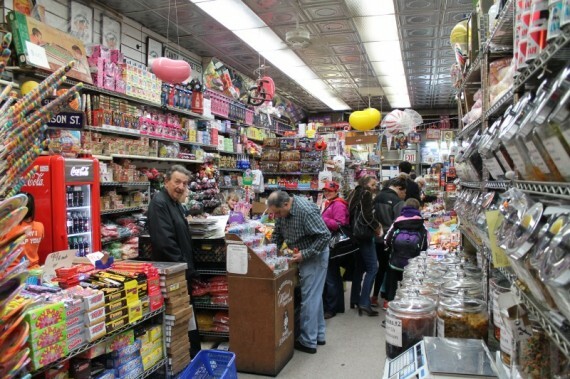 This was a small store but they had every kind of off-the-wall candy imaginable. Or, if there was a candy you thought hadn’t been made in 20 years (like candy cigarettes), they had it. The storedoesn’t look like much from the outside. 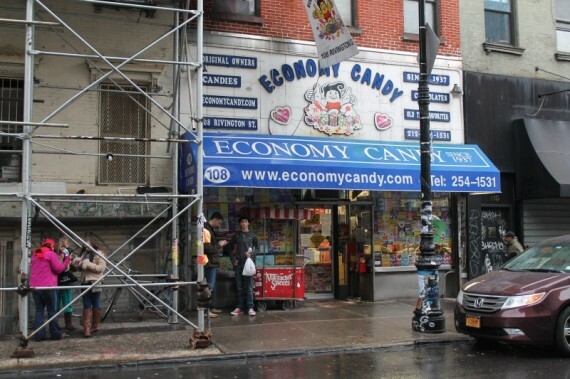 We left with a bag of candy big enough to make me question the “economy” in Economy Candy. But Marissa is happy, and she has been a real trooper so far on this trip. Eat up, Marissa! By this time, it was getting late in the day – around 4pm. 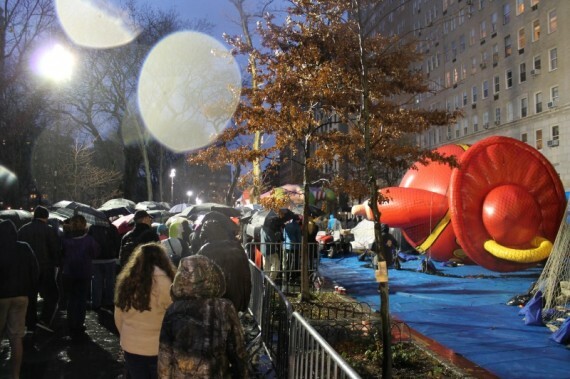 We took the subway up to the 72nd Street station at Central Park West to watch the balloons getting blown up for tomorrow’s parade. 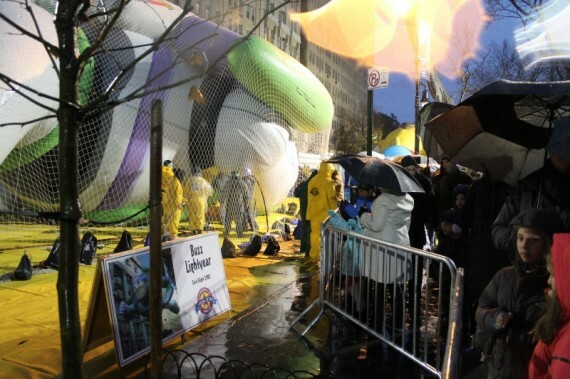 They inflate these balloons right across the street from the American Museum of Natural History. We definitely saw more children tonight than we had seen cumulatively in New York up to this point. The rain and the drizzle continued to fall and the temperature had dropped throughout the day. 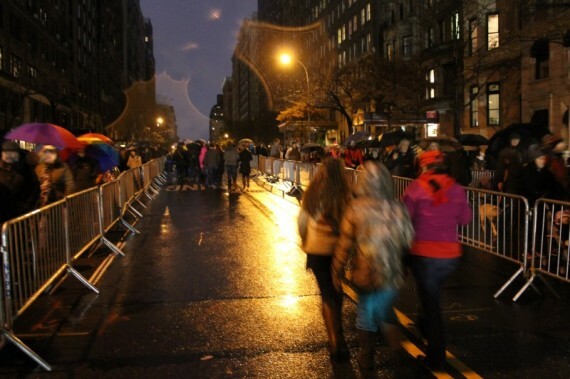 There were lots of umbrellas out, which is dangerous the way New Yorkers wield them. There is a nice setup with how all the viewers are routed in a one-way fashion to view the action. Even though there were a lot of people out, it never did seem like it was elbow-to-elbow. They wound us through these corrals to keep the crowds orderly. We finished our tour of the balloons before 5:30 but with the complete darkness and the cold and the rain, it felt much later than that. 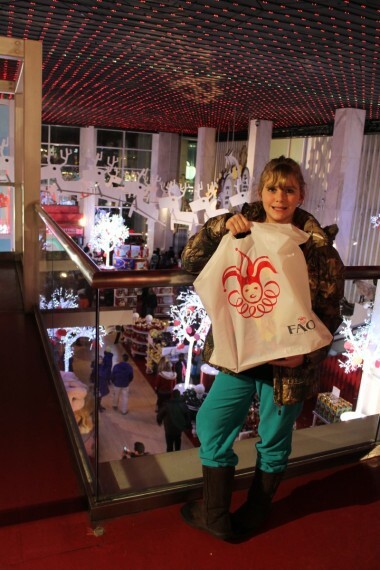 Our next stop was FAO Schwartz so we set out on foot to walk all the way there. 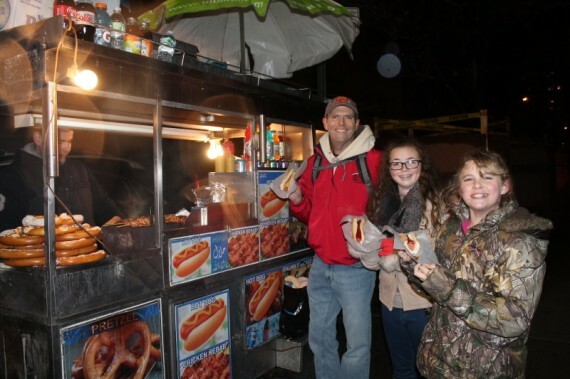 Lucky for us, we were able to cross another item off our food todo list: hot dogs from a street vendor. The girls and I got hot dogs and Stephanie got a chicken shishkebob. She is just way too high class for us sometimes. FAO Schwartz had multiple floors and every kind of toy you can imagine. We spent some time in the Barbie Department and I found a Barbie for sale for $160. We passed. Marissa did ultimately pick out a pony toy and she was in the best mood ever the rest of the night. How do you spell happiness? F-A-O. We wrapped up the evening with a few pretzels and chestnuts from a street vendor. It was our first time to have chestnuts. The ones we ate were soft. Not sure if that was normal, but the taste was okay. 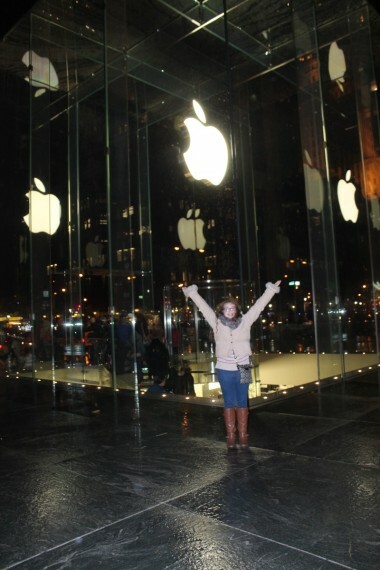 We even stopped at the Apple Store on 5th Avenue for Mallory, and everybody got hot chocolates at Starbucks. Mallory is on top of the world. The rest of the travel party had a great day visiting the American Museum of Natural History, viewing the balloons, and then a meal out in New Jersey. We all eventually ended up at the hotel at roughly the same time – around 9:00. We have made our cab reservation for the morning at 5am. 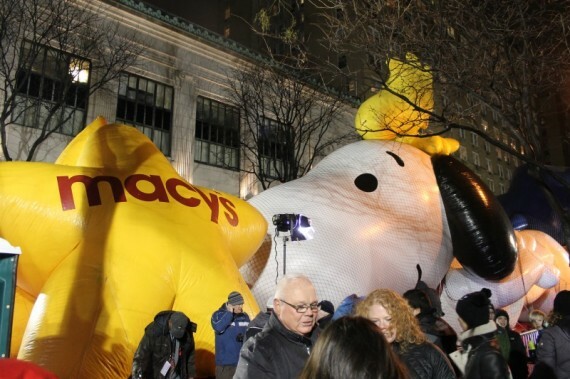 Looking forward to viewing the Macy’s Parade and even more to seeing Miles perform in it.